Take the same powerful functionality of the multitask toolbar to your subtasks! Easily select multiple subtasks and make all of the same bulk actions. You can perform the following bulk actions with the Multitask Toolbar. Set Watchers: Watchers are those who can see notifications and stay aware of everything happening within a task, even if they are not an assignee. Set Assignees: Quickly change or add users to be in charge of a task. Need to move multiple tasks to a new team member? Check the tasks and take care of it with one click! Set Status: This allows you to push multiple tasks through your workflow. When looking at your progress in List View at the end of the day, check what needs to be moved and quickly push it forward. Set Tags: Apply one or more Tags in bulk. This is the fastest way to add more structure to your task organization. Move Subtasks: Move your subtasks to a new List, Project, or Space. Set Due Dates: Quickly apply a due date to a group of tasks. Just click on the due date icon in the toolbar, and you'll get a drop-down to select the date of your choice. Set Priority: Find a group of important items and adjust priorities at the same time! Let the Multi-Task Toolbar do the work. Remove Tasks: Nothing is more frustrating than trying to clean out your tasks and having to delete them one.. by one.. by one. Check off all those tasks that are unneeded and quickly have them removed from your list. Archive subtasks: Close subtasks and clear them from view instantly. You can find them any time by going to your search bar! 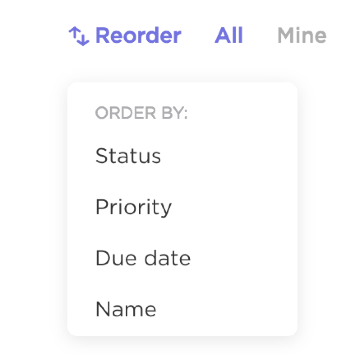 Automatically "Sort" or re-order your subtasks with the click of a button!